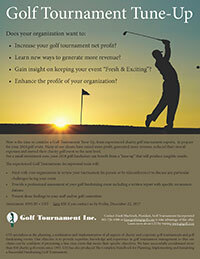 Golf Tournament Tune-Up – Golf Tournaments Inc.
Increase your golf tournament net profit? Learn new ways to generate more revenue? Gain insight on keeping your event “Fresh & Exciting”? Enhance the profile of your organization? Now is the time to consider a Golf Tournament Tune-Up, from experienced charity golf tournament experts, to prepare for your 2018 golf event. Many of our clients have raised more profit, generated more revenue, reduced their overall expenses and moved their charity golf event to the next level. For a small investment now, your 2018 golf fundraiser can benefit from a “tune up” that will produce tangible results. Cost : $595.00 + HST. Copyright 1993 - 2017 Golf Tournaments Inc.
WordPress customization by TUBMAN Marketing Inc.